Vegan Blogs: What I’m Reading – Is It Vegan? One of the things that is ingrained in every vegan, is the desire to read. Read everything. We read labels, we read packages, we read boxes and bags. We’re always reading. This is a good thing. Hopefully, we’re all reading good stuff (put down that tub of Tofutti Better Than Cream Cheese and pick up the Sticky Fingers Sweets recipe book instead). Sometimes good stuff is hard to come by, though. The internet is awash in mediocre. Below I’m going to list off some of my favorite vegan-specific blogs. Give them a shot, and if you know I’m missing a great read, shout out the site in a comment below. Make sure to add a quick one sentence description too so I know what I’m getting myself into. When people ask me, “but where do you get your protein from?,” after my initial forehead smack, I direct them to The Vegan RD. Or basically, any question that involves dietary needs. This guy, Jack Norris RD, knows it, and knows it in depth. Plus that little “RD” after his name gives him LOTS of credibility. And if that isn’t enough for your “steak loving uncle who doesn’t believe anything if it isn’t in a book,” you can always hand him a copy of Jack’s book, Vegan for Life: Everything You Need to Know to Be Healthy and Fit on a Plant-Based Diet . This one gets solid reviews from all over the board, diehard vegans to mainstream book reviewers. It’s a winner. Some people are into model airplanes, others are into stamps. Not me. I’m into sneakers. And have been for ages. Tracking down vegan sneakers can be down right exhausting. Most American companies aren’t very forthcoming with detailed product information. It can be frustrating trying to figure out if an embellishment is leather or pleather. That’s where Vegan Kicks comes in. His niche is sneakers. 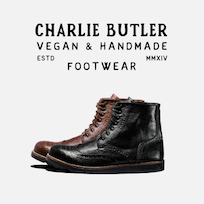 Vegan sneakers. And he gives ALL the details. I’m a big fan. And like us, he does his research. He’s frequently in contact with sneaker companies and gets all the info necessary, right down to the pleather status of that embellishment. I love travelling. I love walking new streets, hitting up shops I’ve never been too, and of course, eating at new vegan spots. In the last few years, my travel budget has declined, and my ability to travel has been reduced. That’s ok because now I live vicariously through Vegan Pilot Marty. Marty is a charter pilot that made the vegan switch a few years back. Since then, he’s been on a mission to chronicle vegan spots all over the United States (I don’t think I’ve seen him travel abroad yet). It’s a great read for lovers of food and travel, especially when his travels take him to unlikely vegan havens. I still can’t believe he’s never eaten at a Moe’s before, though. I mean, c’mon, there’s one in terminal C of Hartsfield-Jackson. Worcester Mass is my old stomping grounds. It’s the town where I met my first vegans and ate at my first vegan restaurant (shout outs to the old Quan Yin on Hamilton St!). I spent years bouncing around that city. The great years (Lily Pad opens) to the bummer years (Lily Pad closes). And in the last few years, Worcester has become a rising star in the vegan-friendly communities. I’d like to think Veg Worcester is a major reason for the upswing. This crew works tirelessly to promote veganism throughout Worcester. Their latest crown jewel is the Worcester Vegetarian Fest. In only it’s second year, I feel it already outshines the Boston Veg Fest. Kudos to Drew and the whole crew. Even if you don’t live in Central Mass, there’s still plenty of great information on this blog. Confession. I’m not much of a cook. Over the years, I’ve improved from brown rice and soy sauce to great tasting bbq tofu, but my culinary vision is very narrow. Anytime you see pictures of an outstanding meal (check isitvegan on instagram), you can guarantee Mrs. Isitvegan whipped it up. She’s a pro. She’s my (culinary) rock. I will take credit for any ridiculous looking sandwich monstrosities though. Which is to say, I don’t read a lot of vegan recipe blogs. They just never seem to capture my attention. But Nom Nom Vegan Noms is different. Not only is it a well written recipe blog, but the pictures are drool worthy. Solid vegan pr0n, you know? Plus this blog is written by friends of mine, one of them is a dude I’ve known for 15+ years. They know about great eats and have some solid life tips. That’s what I’m reading. What are YOU reading? I’m loving Gormandize with A-dizzle and K-bobo. It’s a great recipe blog with really good quality recipes that work every time I make them! I highly recommend it! I recently found this vegan Mexican food site and wanted to pass it along. I love foods from Mexico and love the fact I can still enjoy eating it while remaining vegan. Plus, the dishes are easy (a must for me!) to prepare.